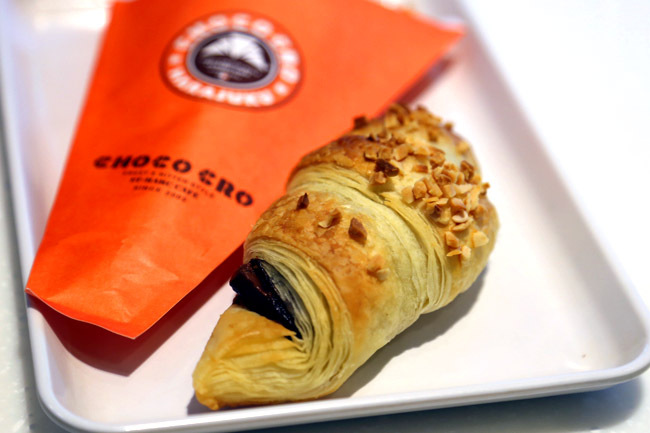 Everybody comes to Saint Marc Café for its Choco Cro, which in short means chocolate croissant. The Japanese tai-tais get it by the dozens, both its white and dark variants, or enjoy it at the quiet part of the café with a matcha latte. You will understand why. 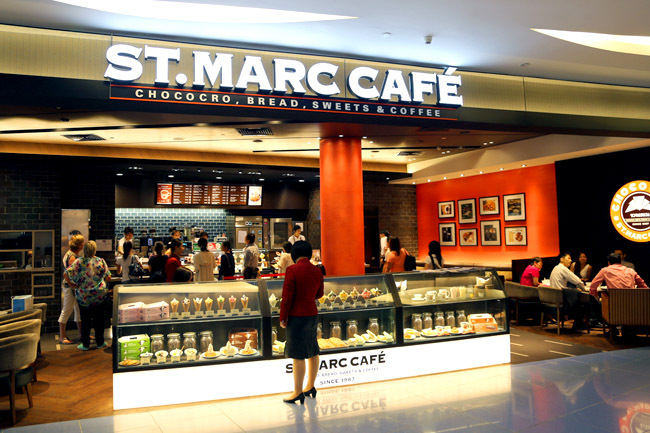 Saint Marc Café is a popular bakery from Tokyo which finally made its first foray in Singapore at Vivocity, after having 300 outlets in Japan and a first overseas branch at Shanghai. The first Saint Marc Café was opened at Ginza Maronie Boulevard in Tokyo way back in 1998, known ever since for its freshly baked breads and pastries. The Choco Cro ($2.40) looks deceiving plain, and initially made me wonder if it was left in the tray for too long. After taking like a dozen pictures of the croissant, I was astonished with my first bite – the pastry was flaky and fluffy, and you rejoice hearing the light crunch as you take every morsel of the bite. The surprise element is the chocolate in the middle, still remaining warm and comforting as it oozes out to leave stains on my lips. I had two on separate occasions, both awesome, and was convinced why this was the best-seller. 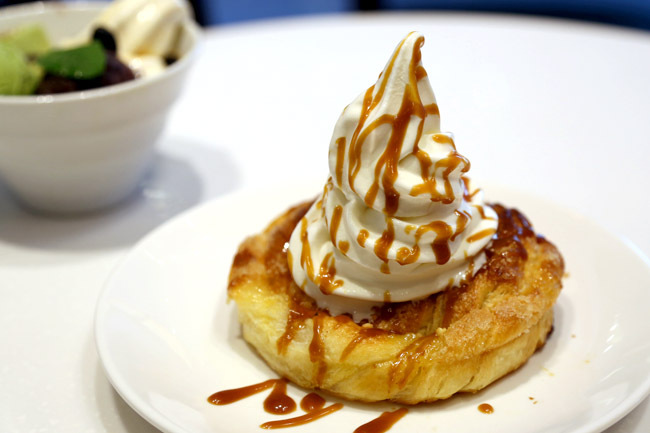 Not best known for its desserts, Saint Marc Café’s offerings was a mixture of hits and misses. 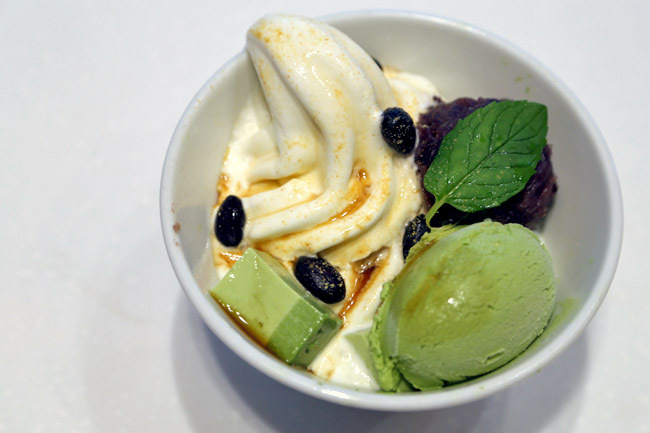 The Gion ($8.20) soft serve melted before I could even bring it to the table for its photographic opportunities (The café is self-service). 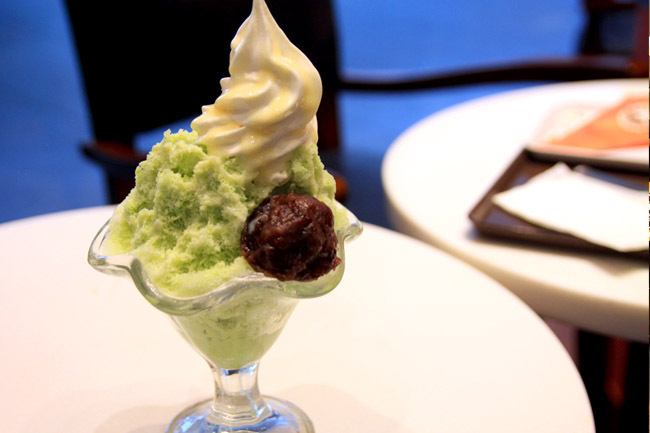 If you look beyond that, the whole mixture ingredients is quite a pleasure, especially relishing the matcha jellies with ice cream, which has a texture firm yet smooth. Its Matcha Milk ($8.80) with a slightly overpriced cost, is a slight disappointment, looking nothing close to those in the food models. I realised most of its green tea products, like the syrup and latte are not its strongest, lacking in that distinct characteristic matcha-ness, letting the milk overpowering the flavour most of the time. So I could safely say you could give the Matcha drinks a miss. I initially thought the Choco Cro was the best thing at Saint Marc, till I discovered the Little Fuji ($6.30), looking quite like the representative mountain (except this is more kawaii). Despite being full, the vanilla soft serve on top of warm flaky Danish pastry drizzled with addictive caramel sauce was quite the bomb. Unexpectedly, this dessert didn’t melt as fast, allowing us to enjoy every single mouthful of cold and hot sensation. Though the counter is self-service, and the menu slightly confusing with too varied items and trays going around, the Japanese cafe makes a lovely place to settle an off-work afternoon. Provided it is already not filled with ladies. The ambience was so comfortable that a customer walked off without her shoes. She must have thought this was home. Saint Marc’s Choco Cro and Little Fuji are indeed to live for, though I won’t die for the desserts. “To live for” – I see what you are doing 😉 hahaha. Hey, that dessert is actually Nara not Gion! Cro and Little Fuji Are To Live For | DanielFoodDiary.comDanielFoodDiary.com.